In the case of Toner vs. No Toner, the jury may still be out, but this beauty lover has come out decidedly in favour. Designed for use after cleansing and before moisturizing, the right toner formula can leave skin feeling extra clean and refine pores over time, all without stripping skin of moisture. Here are three I've tried and liked in the last 6 months. 1. Estee Lauder Perfectly Clean Multi-Action Toning Lotion/Refiner ($28) is a no-nonsense, effective toner that also promises to calm and exfoliate, effectively reducing redness without drying out my skin. To make the bottle last longer, skip the cotton balls (which absorb tons of product) and splash the toner on clean hands and pat directly on your face. 2. 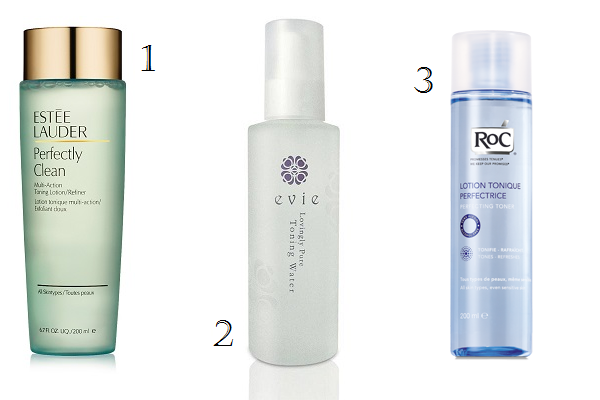 Evie Lovingly Pure Toning Rose Water ($45.95 from Green & Pure) is my hands down favourite of this trio. It's 100% rosewater and smells incredible thanks to the Bulgarian damask roses that are used to concoct it. What's more, the luxe-feeling glass bottle spritzes a cloud of hydrating rosewater mist directly onto skin. I've been storing my bottle in the fridge to extend the 6-month shelf life of this all-natural product and spritzing myself periodically to refresh skin on hot days. 3. RoC Lotion Perfecting Toner ($18 at London Drugs) is similar to Estee Lauder's formula but best applied with a cotton pad. This is an affordable option suitable for all skin types that promises to invigorate skin. During testing, I was really impressed with how much trace residue, oil, and makeup it removed, leaving behind a deep clean feeling without being harsh. Hmm, I usually don't wear a toner but maybe I should try one of these! I think I've just had bad experiences with them in the past with them drying out my skin. Thanks for the reviews! The Evie one is really gentle.